Audi has unveiled their F12 e performance prototype. The e performance research project has concluded after three years of work. Audi collaborated with Bosch and several institutes at the RWTH Aachen University to develop a technology platform that is a major advance for electric mobility. The platform's modules can be used in a variety of electric-powered automobiles. One such vehicle is the sporty "e Sport" technology platform. Electric drives represent a key topic for the mobility of the future. 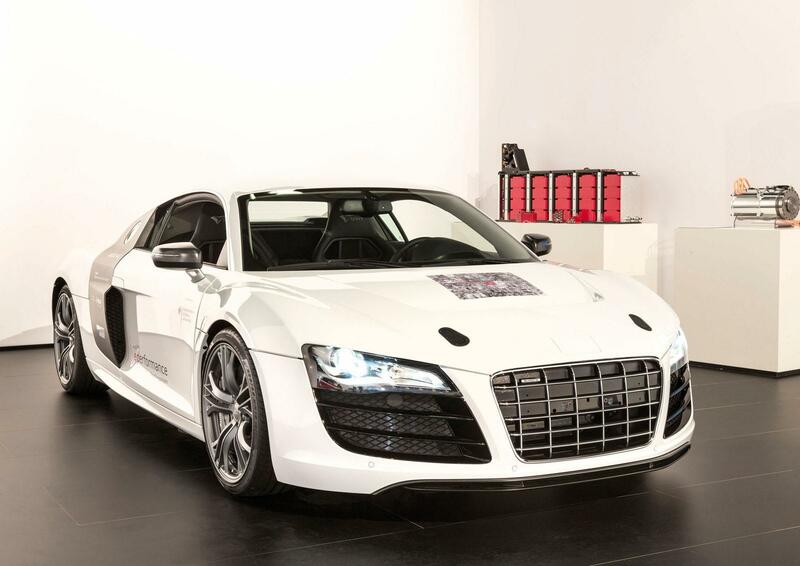 The Ingolstadt carmaker therefore launched the e performance project on the premises of Audi Electronics Venture GmbH (AEV) on October 1, 2009. The objective: a scalable systems architecture for electric-powered cars, a flexible technology platform that also includes a plug-in hybrid drive. It should be suitable for use in everything from a sports car to a sedan to a city car. Experts from both industry and academia were involved in the project, which had a budget of €36 million. The engineers from AUDI AG and Audi Electronics Venture collaborated closely with Robert Bosch GmbH, Bosch Engineering GmbH and three institutes of RWTH Aachen University: the Institute of Automotive Engineering (ika), the Institute for Power Electronics and Electrical Drives (ISEA) and the Institute of Electrical Machines (IEM). The technical universities of Munich, Dresden and Ilmenau, Leibniz University Hanover, the Fraunhofer institutes IESE and IISB as well as Forschungsgesellschaft Kraftfahrwesen mbH Aachen were also members of the consortium. The German Federal Ministry for Education and Research (BMBF) supported e performance with some €23 million. "Our team united engineering art, creativity and a portion of lateral thinking," says Dr. Christian Allmann, one of the project managers. "Young, independent free-thinkers worked together with the experts from the Technical Development departments at Audi and Bosch. We enjoyed a constant sharing of our respective knowledge and different work cultures." "The project was very dynamic with respect to personnel and technologies, resulting in a very flexible collaboration with open interfaces," adds Martin Schüssler, Allmann's colleague. e performance was broken down into a dozen work packages from the energy storage system to the control concept to dynamic stability control. In the initial phases, the participants worked mostly with advanced simulation tools, then they built submodules and finally a drivable car, the F12. The sports car looks like a production Audi R8 on the outside, but it is purely electric-powered. The F12 represents the "e Sport" model within the modular system platform. One of the key subject areas of the project was the high-voltage battery. In the F12, it comprises two separate blocks with an overall capacity of more than 38 kWh. Each block is made up of 200 macrocells. The beveled walls allow the macrocells to shift relative to one another for additional safety in the event of an accident. Cast aluminum sections in the battery system absorb a majority of the crash energy. Computations and initial tests on the component level indicate that this innovative safety concept can even withstand a side impact with pole. The research car is powered by three different electric motors, each of which can be controlled separately. During slow driving, only the synchronous motor at the front axle is active. At higher speeds, the performance-optimized asynchronous motors at the rear axle come into play. Together the three electric motors produce 150 kW (204 hp) and 550 Nm (405.66 lb-ft) of torque. Their interaction makes the e Sport a fully electric quattro. Another of the technology platform's innovations is the switchable high-voltage electrical system. The two batteries deliver different output voltages of 144 or 216 volts. The uniform system voltage required is provided by means of a DC/DC converter. Under part load, the voltage is around 200 volts to maximize efficiency. With increasing power demand and speed, this increases to as much as 440 volts. The F12 also uses an efficient heat pump for the thermal management of the drive system and the interior. It regulates the temperature of the batteries depending on the situation and can also store heat in them so that less energy is required to heat the interior the next time the car is driven. The F12 driver controls basic drive functions - Park, Reverse, Neutral and Drive - by operating buttons on the center tunnel. All other operations are controlled via a tablet computer that can be removed from the center console. A user-programmable instrument cluster presents all key information in high resolution. "From the very beginning, our initiative was the largest interdisciplinary research project in Germany for electric cars," concludes Christian Allmann. "Everyone who was involved gained competence and provided valuable qualification among themselves according to the ‘open innovation' principle, including for the employees at the companies and universities." This is also reflected in the 20 degree theses and 50 doctoral theses that resulted from the project. Thanks to modern development tools and innovative knowledge management, the project partners were able to network very flexibly. The researchers used cameras to document each design step and made their knowledge available on a server accessible to all collaboration partners throughout Germany. This transparency and tight networking made e performance into a research project with a profound halo effect for Germany as a base of research and industry. The partnerships did not end with the completion of the F12. The first follow-up projects focusing on specific technical topics such as thermal management have already begun. Individual solutions, such as the CFRP housing for the rear battery, show good prospects for later production use. The German Federal Ministry of Education and Research wants to continue to support the development of new automobile concepts, primarily in the areas of the battery, high-performance electronics systems and overall energy management.